The new Sony FS7 has a dynamic range of 14 stops, Super 35mm CMOS sensor and a native ISO of 2000. It records 60fps in 4K (slow motion up to 180fps). This camera is able to record ProRes 422 with XQD cards. It has ergonomic design and includes internal ND filters. 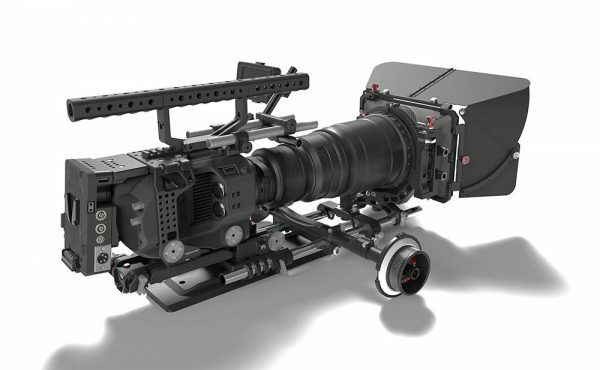 The Sony FS7 is a documentary style camera, with shoulder mount comfort without rigs. It weighs only 2.25kg and has a reduced size. It has a solid structural magnesium construction, resulting up to three times lighter than aluminum. The FS7 incorporates an expandable arm that ends in a handle that allows to control the functions of camera that are necessary for the recording. Zoom control, rec button and menu control. Zoom, Start/Stop and Assign controls are carefully located on the sculpted, telescoping smart grip. Sony supplies a proper viewfinder that's perfectly offset to the left with a huge range of fore-aft adjustment. The Sony fs7 a tremendously versatile camera. It records 4k and HD in formats XAVC-I, XAVC-L on card. With the XDCA module it offers the possibility of shooting in Apple ProRes 422 internally (1920x1080) or RAW 2k and 4K with external recorders. Its E-mount Sony offers all type of adapters for interchangeable lenses, this allows to use cinema lenses that in combination with this Sensor offers great cinematic images. With the Sony Fs7 there are a lot of advantages. An important one is its mount and the compatibility it offers with Sony´s lenses and lenses of others suppliers.The FS7’s E-Mount can take Cinema lenses and SLR lenses with an adaptor, as well as Sony’s E-mount and A-mount lenses.So whether buying new lenses, or making use of lenses you’ve already purchased, the FS7 will give you great freedom to find the look you want. There was a clear objetive at the time of designing the ergonomics of the SONY Fs7, its handheld design needed to remain comfortable even over the course of long shoots, to support hour after hour of recording—without changing memory cards. Furthermore this camera provides the latest in resolution, exposure latitude, and colour reproduction. With this camera SONY manages to deliver it all in one affordable and practical package with success. It is a highly adjustable control centre located on a pivoting, telescoping arm. The smart grip includes Zoom, Start/Stop and a range of Assign controls, including a dial you can use to adjust Iris. So you can operate the camera without taking your hand off the grip. The shape is comfortable hour after hour. And the angle of the grip can be adjusted at the press of a button. We all know that the size does matters when we are talking about sensors. With the Super 35 sensor of the Sony you could defocused backgrounds and deliver bokehs. The use of the shallow depth of field for directing the atention of the viewers is a resource you could easy use with this sensor.This is something easier with a longer sensor, like the fact that a bigger sensor equates to better low-light sensitivity and lower image noise or that the field of view is wider for any given focal length lens. The FS7 provides continuous recording at Full HD at frame rates of up to 180 fps. When you play back at 23.98p, you’ll enjoy extraordinary Super Slow Motion of up to 7.5x. Compared to burst mode, the continuous recording of the FS7 reduces mistimed shots and extra takes. This camera also provides Slow & Quick motion from 1 fps to 180 fps, in 1 fps increments. This enables time lapse effects to make the clouds race by or flowers bloom before your eyes. And for even higher frame rates, you can attach the XDCA-FS7 extension unit and connect an outboard recorder, both sold separately, for 2K RAW recording at up to 240 fps. This creates 10x Super Slow Motion when played at 23.98p. A built-in Neutral Density (ND) filter wheel includes positions for Clear, 1/4 (2 Stops), 1/16 (4 Stops), and 1/64 (6 Stops). The FS7 takes advantage of Sony’s flexible Multi-Interface (MI) Shoe, which provides power, signal connections and coordinated on/off switching to compatible Sony accessories. For example, you can connect and control Sony wireless microphone systems such as the UWP-D11 or UWP-D12 or attach the HVL-LBPC light. The FS7offers 4-channel audio input. In situations such as interviews, this function enables the simultaneous use of an external microphone for recording ambient sounds, the built-in microphone for voice recordings by the operator, and two optional UWP Series wireless microphones for voice of interviewer and interviewee. In addition, by the use of an optional XLR adapter “XLR-K2M” or ”XLR-K1M” which provides additional 2 XLR inputs, possible applications are further expanded. The Sony FS7 camera offers the possibility of recording with the compressed colored CUSTOM MODE signal or recording with a logarithmic curve, for example the S-log3 or S-Log2 and display a LUT through the sdi outputs or the CINEMA EI MODE LCD. Any of these curves, even having to compress the latitude for television broadcasting, adjust the targets, leaving them 90% lower to have more flexibility in the highs lights between 91 and 110%. Recorded images appear underexposed and with lack contrast. But in counterpart we will have many stops to go up or down in high and low lights. To control the exposure we use the waveforms that measures the signal.If that signal comes with an applied LUT, the measured values will be in relation to this LUT. Each LUT has its exposure levels to follow, but generally the average gray should be around 41%.